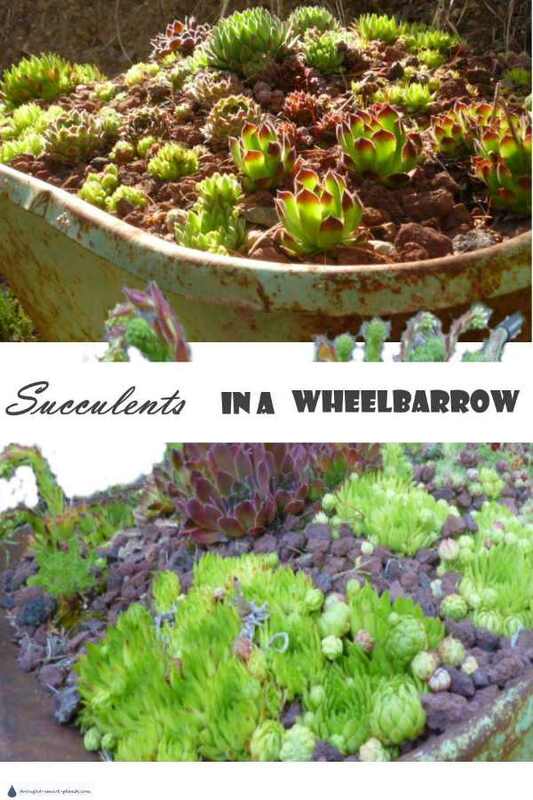 For an eye-catching and unique focal point, try planting your succulents in a rustic wheelbarrow. 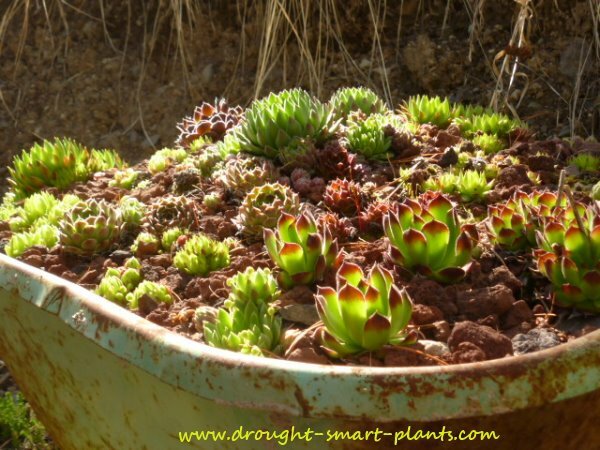 Find one that has some drainage holes in it already, or puncture it yourself – your succulents need drainage. Look for wheelbarrows in recycle centers and thrift stores or at garage sales. Sometimes you can find old wheelbarrows in junk piles behind somebody’s garage or shed. With all the interest in rustic salvage these types of funky containers are becoming more appreciated all the time. Try and see the diamond in the rough – you won’t need one that actually still works, just for displaying your succulents. The best ones are those with metal wheels, not tires. If you do find one with a tire, and it’s a solid rubber one, that will work just fine. You can also just take the tire off completely. 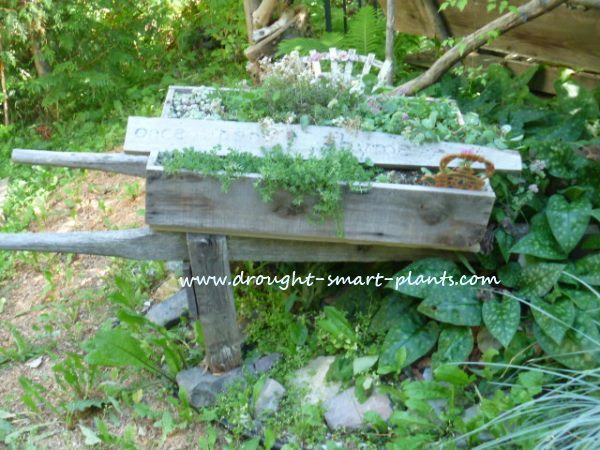 If you leave it on, sometimes once the wheelbarrow is filled with soil and succulents, it can be a little top heavy and fall over, spilling the plants and soil along with them. I’ve found old wheelbarrows that were pretty much done, but I built a top tray out of barnboard to plant into. Sedum are fabulous in combination with each other to complement the textures and colours of their neighbors. Choose sedum for containers or sedum for groundcovers for some great combinations. Sempervivum – these increase in number every year as the ‘hen’ rosette has more ‘chicks’ once established, to eventually create a tapestry. Use many different types, colours and sizes for the best effect. They come in all different forms; clustering or solitary growth habit, covered in down or sleek like a rubber wetsuit. Jovibarba – similar to Sempervivum, these are even hardier in winter conditions. Their only requirement is very well drained soil, both before the winter and during it. They do best in soil with lots of added pumice or grit. 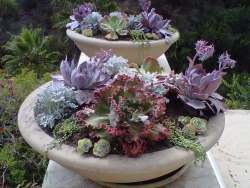 For a tender succulent display that in most areas of Canada won’t survive the winter, use the many forms of Echeveria, as well as Aeonium, Crassula and other low growing tender succulent plants. Again, these need to be kept fairly dry, except when growing rapidly. Mulching with lava rock or pebbles, or even polished glass in a contrasting or complementing colour will help cool the soil and retain a tiny bit of moisture. Plant full, that means don’t leave room between the plants, especially if it’s a one season planting. You can take the display apart and take the tender succulents inside for the winter, the hardy Sedum, Sempervivum and Jovibarba will flourish outside as long as they are in a well drained soil. The Sempervivum in particular have the potential to die back if they are too wet before they freeze. Just make sure you have replacements in an out of the way corner of the garden in case you have to replant.